Stanton Millworks created a variety of custom casework for the Mercy McAuley Legacy Center. Mercy McAuley is a new Cincinnati high school created from the merger of Mother of Mercy High School and McAuley High School. 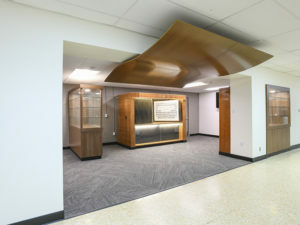 Both schools moved into the McAuley High School building in August of 2018, after updating and renovating several key spaces in the 1960 structure. HGC Construction was the general contractor for the project. In an effort to celebrate and preserve the two schools’ separate histories, their new facility features a Legacy Center. The center includes several custom-made bookcases displaying treasures from both schools’ pasts. Stanton Millworks created the four display cases with a plastic laminate wood grain finish. The two freestanding displays were designed to have the ends as unobstructed as possible. The hope was to have them completely unobstructed, but some kind of support for the shelves was required. So Stanton installed 2” posts, which minimized obstructions but gave support and a place for shelf pins. Catch a glimpse of the Legacy Center in a piece by WCPO.